Things have a habit of moving on – some might say change is inevitable, but I do get a little irritated by it all. Things change – and we hardly get a chance to find out if it’s good or bad, if we like it or we don’t (which are not always related in a simple easy to understand way) and they go and change again. So, since I saw you last, we’ve moved house. Oh, and we’ve been on holiday. And now suddenly it’s autumn. What is going on? Why is there no time to sit and contemplate the complexities of the situation and arrive a rational decision, instead of just leaping from one frying pan to another trying to keep out of the fire by guesswork, a little luck and trust in the randomness of fate? Anyway, here we are in autumn and to rub it in we have toadstools all over the place. They don’t look out of place among the browns and oranges of the past-their-use-by-date leaves that the trees are littering the place with. I may have said it before but in autumn it bears repeating – Nature abhors efficiency – there, you read it here first. It really is no wonder that mankind (that includes womankind) and nature are continually at loggerheads. Nature happily wades about spilling stuff right, left and centre and humans (there that’s more inclusive) rush around behind her, trying to tidy up. We weren’t the first to develop the throw-away society you know. Admittedly nature is more into recycling than we are. 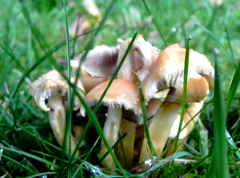 As you can see from the dilapidated state of the toadstools in the picture – I wasn’t the only one who wasn’t sure if these were Gnome Homes or Gingerbread Cottages. Nephew Chris is walking across the Irish Sea – I hope the Irish don’t mind having their sea trampled on – I’m sure he’ll be careful where he puts his feet.